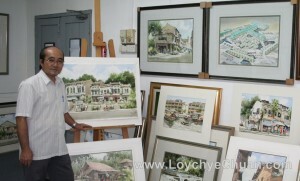 Watercolour artist Loy Chye Chuan at his studio. Loy Chye Chuan is a self taught watercolour artist in Singapore. Without formal art education, he learned his way through attending watercolour exhibitions and live demonstration sessions by established artists like Lim Ching Hoe and the group along the Singapore River side more than 50 years ago. Through observing the techniques and strokes of the established artists, Loy Chye Chuan slowly developed his own style of painting watercolour with frequent practices alongside with the masters. Experimenting his art pursuit with different topics and subject matters that he related to, the artist established himself as not only an expert in watercolour painting of landscape scenery and street scenes, but also one who has a heart for social phenomena and a mission for their reflection in his art works.. The watercolour studio of Loy Chye Chuan is opened to public from 2pm to 5pm on weekdays. Is it possible to visit your studio on a Friday afternoon? Please feel free to visit the studio any day after 2pm. Hi, do you run any classes now for adults? The watercolour classes for adults are on going daily 2pm to 5pm. Feel free to drop by the studio at Telok Kurau lorong J, Level 3, Room 307.